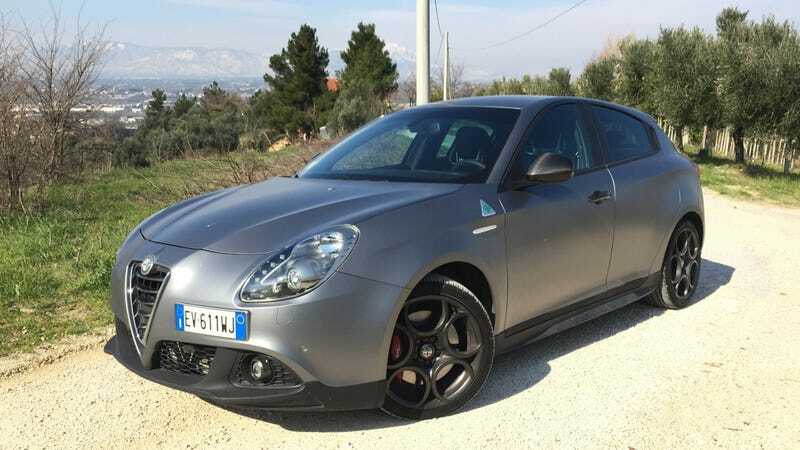 When I learned I’d be driving the Alfa Romeo Giulietta Quadrifoglio Verde, my mind was filled with the denizens of the Italian Car Cliche Swearbox. Words like passion and soul consumed my predictive thoughts, even though I wasn’t entirely sure how they applied. But I didn’t find them anyways. What I did find was much, much better. Hold up, let’s step back a bit from the Alfa, and bear with me through a painful, tortured metaphor. Paul Verhoeven is a Dutch maker of big Hollywood action films. Or rather, was a Dutch maker of big Hollywood action films, as since returning to the Netherlands in the early 2000s, he only made one big movie, and it was in Dutch. And the American cinema landscape has never really been the same since he departed our golden shores. Over a period of just a few brief years in the late 1980s to the mid-1990s, he gave us Robocop, Total Recall, and Starship Troopers. All movies that were, on balance, no Schindler’s List. They won no Oscars for Best Picture. They never won the Palme d’Or at Cannes. No two-bit film snob ever quoted those in an essay filled with references to Truffaut, Visconti, and Mizoguchi. But they were, in short, great. They were bombastic and beautiful, full of quirks and iconic performances. Not because of they way they emoted, but because of how they captured a beautiful feeling of unabashed, unashamed love for that which wasn’t perfect. We don’t get anything like that here in America, anymore. It belongs to a past era, one we all pine for and none of which have been able to replace. Michael Bay films are too slick, James Cameron films are all trying too hard. And, in a way, that is the Alfa Romeo Giulietta Quadrifoglio Verde. Slightly less than perfect in almost every single way, and in that totality, perfection is achieved. It’s a massive cliché, but no, this isn’t your grandpa’s Alfa Romeo. It’s not some slick race car, it’s not some drop-dead stunner, it’s just a hatchback. A hatchback which competes with the Volkswagen Golf, and the Honda Civic, and the Mazda 3. And you don’t really get any quirks with those. They just take you where you need to go, they do a good job, and they do it competently. Sure, there are variations between the competition. One might be a little more sprightly, another might be a touch more practical, but for dreary point A-to-point B transportation where you just commute and sit in traffic for three hours a day, you won’t find monumental differences. But then, there is this Alfa Romeo. This beautiful, impeccable, wonderfully imperfect Alfa Romeo. All of those other cars have had their problems beaten and bred out of them. They grew up long ago. If we’re being honest, most gripes that remain are nitpicky, and are reflections of personal taste. But once again, there is this Alfa Romeo. Not everything has been slaved over by armies of engineers and user experience experts. Not everything has been ruined by refinement, and that makes it sublime. Take the front seats, for example. In the Quadrifoglio Verde, they are devastatingly gorgeous. Just looking at them makes your hands tremble so much you can’t take proper photos anymore. Covered in suede-like Alcantara, each front seat is etched with half of the Alfa Romeo logo. Together, they form one harmonious whole. They make eyes melt and grown adults swoon. They make children weep with envy and dogs bark at random objects that definitely aren’t there. And then you sit in them. There’s barely any side bolstering so you slide about in hard corners, and the headrest actually seems to disappear into a void before coming back out and smacking you in the back of a head, like a cushy, padded scorpion’s tail. Sure, that’s all not-so-comfortable, I suppose, but at least it’s not dangerous. As you’re driving along in a straight line, they don’t actually impede safety. But then you go to change lanes, and you turn your head to see if anyone is hiding in your blind spot. At which point you notice that the seat and the B-pillar line up just so incredibly precisely as to completely block your vision. So then you can’t see anything behind you, but you’re not looking in front, either. So you can’t see anything on the road at all besides your own seat, and you pray that you don’t die, right there on the autostrada. A Volkswagen engineer would spot a problem like that on a pre-production Golf, mutter about something about “zis is nicht good enough,” and send the whole thing right back to the drawing board. But the good people over at Alfa? Someone probably noticed this was an issue, but, on the other hand, those seats look exquisite. And to send them back would be too big a shame to bear, so there they still are today. Then there’s steering. Alfa uses a driving mode system called “DNA,” instead of bothering with easy-to-understand modes like “comfort,” “winter,” and “sport.” So now you’ve got Dynamic, Normal, and All-Weather, which is fine. In Normal mode, it all feels, well, very normal, and not at all like the super-hot version of a hot hatch. The suspension is comfortable, even pliant, the dual-clutch transmission is in automatic mode, and the steering is light. It’s all sort of uneventful, really. But put it into dynamic mode, and the steering wheel twitches over every little bump, with delightful miniature conniption fits letting you know exactly what you’re driving over. It’s the perfect communicative steering wheel, and it just makes you happy. Until you realize that the leather on it almost feels rough and plasticky, so it’s not 100% flawless. And the middle of the wheel is actually just a Frenchman’s hat. Which is almost better than the most polished diamond in the world. The aforementioned dual-clutch transmission is wonderfully terrible as well, setting it far apart from anything you’ve ever experienced in something like a Volkswagen GTI. Not every shift is lightning quick, and in automatic mode they don’t always come when they really, really should, leaving you to wait like a 15 year old who just sent the first text message to a boy she really likes, and yet it doesn’t come until months later, and he’s all, “oh sorry, missed this! LOL :-). It makes the same mistakes you would make if you were getting a little too excited on a road. At some points it’s too early, at other points it’s too late, but it doesn’t matter. It doesn’t make you feel like a professional driver, just like a better version of the driver you already are. It doesn’t feel like there’s a Mechanical Turk in the gearbox. It’s just a mechanical you. And then you realize the shift paddles are made out of the same plastic as McDonald’s uses for the toys in its Happy Meals, and this is the first DCT transmission where you’ve actually gotten the clutch to slip going up a hill. And even though it still delightfully blips the throttle when downshifting aggressively, the four-cylinder, turbocharged 237 horsepower engine sounds like an angry sewing machine. In short, it’s a bit like a really good friend. A proper friend is always there for a great time, a proper friend doesn’t rattle you until you cry, but then again, a proper friend doesn’t always do everything quite properly. A really good friend is human. And in a way, the Alfa Romeo Giulietta Quadrifoglio Verde is more human than any other car out there today. It’s not perfect, but everything that’s wrong with it makes it an absolute joy.